MPEG compression dramatically decreases the amount of storage space required to record motion picture sequences by eliminating redundant and non-essential image information from the stored data. Less total bits means that motion pictures can be transferred more rapidly, so rapidly in fact, that slow, but inexpensive, communication lines and storage devices have entirely new moving picture applications. The following set of pictures are actual screen captures of a frame undergoing MPEG compression using the PixelTools' MPEG Expert-1. Two adjacent frames in a motion picture sequence are usually very nearly identical. Often the only difference is that some parts of the picture have shifted slightly between the frames. MPEG compression exploits this temporal redundancy by carving each new frame into convenient pieces and searching the previous frame to determine where each piece came from. If the content of the current frame was mostly sent in the previous frame, why send it all again? Just send the instructions for shifting pieces of the previous frame to their new positions in the current frame. Within a single frame many patches, such as regions of sky or walls are almost entirely the same color. Again, MPEG compression exploits this spatial redundancy by carving images into convenient pieces and reducing such patches to a single color. If several pixel points in the same area are all very nearly the same color, why send the same color over and over? Just send the color for the whole area once. The human eye is forgiving of approximation and outright elimination of the finest details in images. This is fortunate because there is proportionally a lot more fine detail than coarse detail in images. MPEG compression approximates the intensity of fine detail with just a few shades (and progressively more shades for coarser detail) saving many bits over full representation. The eye also sees less color changes per inch than it does brightness variations. MPEG compression exploits this reduction by eliminating non- essential color detail that the human eye tends to gloss over anyway. This image represents an image that has been carved up into about 300 squares to perform the compressions mentioned above. This image is part of a well known test motion picture sequence that depicts passage from left to right along a row of houses fronted by a strip of colorful flowers. The gray patches represent areas that were found in the previous frame and shifted to new positions to form this frame. A uniform gray patch indicates an exactly matching area was found. Mottled gray patches indicate a near match. This operation is performed to compress temporal redundancy, the nearly complete replication of the same picture in two adjacent frames of a sequence. Note that close matches for some squares could not be found in the previous frame. There was no close match for the new image detail that shifted into view on the right edge or for the tree that is passing by rapidly in the foreground. The process of finding the squares in another picture is called motion compensation and is very computationally intensive. Applying motion compensation to reconstruct an compressed MPEG sequence is, by contrast, a much easier task. This characteristic is called asymmetrical compression or encoding: hard to compress but easy to decompress or decode. A blowup of a section of Image 1 with the blue lines (called motion vectors) indicating the exact location of the best matching group of pixels in the previous frame used in motion compensation. 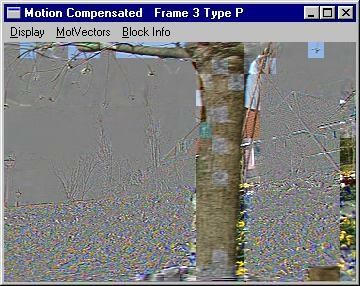 This motion vector (maybe 4 bits of data) is recorded in the MPEG stream instead of the group of pixels (2048 bits). The original picture with a tremendous amount of detail and color has been transformed to the representation shown in Image 1 with the first compression step. It is important to notice that resultant picture is now nearly one uniform color (the gray) with some finely mottled detail. Represents Image 1 after preparation for the second compression step. Picture 3 is measure of the amount of detail remaining in the picture after the first step. More and brighter areas represent the uncompressed detail remaining in the gray picture. Note that this image is mostly black, meaning that little detail remains. The detail which does remain is typically concentrated into one corner of the original square patches which indicates that it is mostly of a single color. The final compression step consists of reducing the number of shades used to represent the fine picture detail. This corresponds to reducing even further the intensity of the light areas representing fine picture detail (the areas not in the single color corners.) In addition to applying more reduction to fine detail within a single square, MPEG provides separate weight for each whole square. Squares containing more fine detail are compressed relatively more. Image 4 shows the relative amounts that each square patch is reduced. The final representation is nearly all black which is nearly all zeros or very small (short) numbers. These short numbers require very few bits to be stored or transmitted. The formerly, complex and colorful picture sequences have been reduced to the minimum essential representation required for storage or transmission in highly compressed MPEG format.